How to "pause" a contact in main automation while they are in a secondary automation? I have a main automation that runs when a contact signs up. It has a whole series of weekly emails that run to keep the contact engaged. At times, an email may offer them a chance to go deeper on a particular topic. If they opt in to that, I put them in a separate secondary automation that is more intensive on a specific topic and emails more frequently for a couple weeks. While this is happening, I don’t want the main automation to keep sending emails. However, once the contact is finished with the intensive secondary automation, I would like to dump them back into the main automation and pick up where they left off. I’ve wondered if there is some easy functionality for pausing a contact in a particular automation until a trigger happens? Right now, I tag the contact when they enter the secondary automation with and “ACTIVE-AUTOMATION” tag. And in the main automation I’m having to add a if/then tree at each and every email in the main automation to see if the contact has the “ACTIVE-AUTOMATION” tag. I then have them “wait until” the tag is removed (which happens when they complete the secondary automation). At that point, I then have them moved back into the flow of emails in my main automation. I have attached a screenshot for clarity. 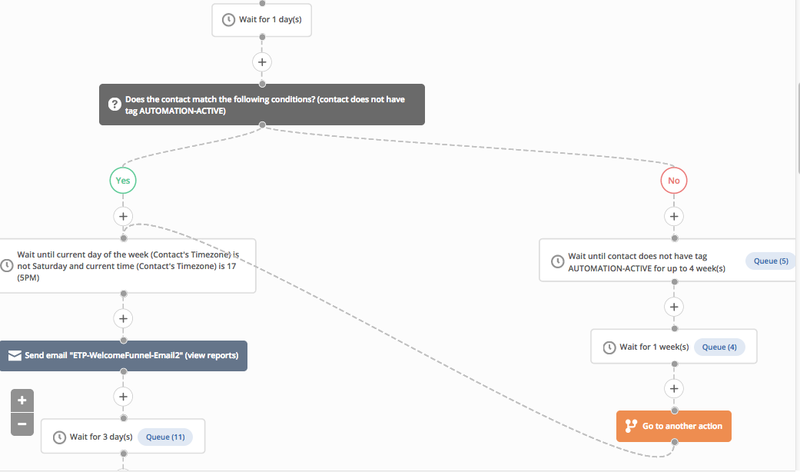 While my solution is working, it creates a very complex automation once you get beyond 2 or 3 emails. Any ideas for a simpler solution that would accomplish the same thing? I’m not aware of another way to do this at the moment. I can see how useful a “Pause other automation” and “Resume other automation” action would be here. I’ve made note of this is in our internal idea tracking tool. It wouldn’t hurt to also add it to http://feedback.activecampaign.com. We have a similar situation. We’ve dealt with this by placing if/then between each steo to check the condition each time. If the condition isn’t meet the automation continues. It’s not ideal but it does work. That’s a smart solution, @flowbird. The automation would have an “If/Else” that checks for “Is currently in automation…”. If the contact is, it goes into a “Wait until…” with the condition “Not currently in automation…” Then you’d use a “Go to” action to bring the contact back to the other path to resume the sequence. Sorry if this is a dumb question. I’m pretty new to AC. You certainly could do that in many cases. It sounds to me like in this situaiton, with the secondary automations being optional and it being possible to join them at any time, something that straightforward might not work. For instance, what if they opt-in to the other sequence weeks after the campaign went out? The automation needs to be able to pause itself no matter where the contact is in the automation. If you start an automation you can stop another one. What you need to know though is where you were in the first automation. You could increment a tag each time you send an email - then when you finished the second email you start the first automation again but using if/then to jump to the stage you left previously. The other alternative is to combine these automations. Once again you need if/then statements to check on progress - it the contact completed something else branch off to handle the additional steps then use goto to bring you back to where you left off. @Brian, That could make things a little cleaner if you know you won’t be adding additional automations in the future. However the challenge I see is that every time I add a new secondary automation, I’d have to go through my primary automation and enter an additional condition checking for the new automation. And I’d have to do that for each email in the main automation. While using the “AUTOMATION-ACTIVE” tag (described above) does add a little more work on the front end, I can add additional secondary automations at any point in time and as long as I add the AUTOMATION-ACTIVE tag at the beginning and remove it at the end, I don’t have to even touch my primary automation. I appreciate the good ideas from everyone…Hopefully we’ll be able to find one that supplies the functionality we need and makes the automation cleaner and less complex. But I have a feeling that is not going to happen until an additional feature is added to deal with this situation. Thanks to AC’s amazing array of options, I can make it work in the meantime, although it’s a little complex right now. Good point. The tag route is definitely the way to go. Is there some news about the features “Pause other automation” and “Resume other automation” ? So I just had an aha moment about this issue. Why could I not make everything very simple by just using a "wait until AUTOMATION-ACTIVE tag does NOT exist? I’ve been trying to figure out why I didn’t think of this before. Can any of you see a reason why this wouldn’t work? It would keep the contact’s place in the current automation and would wait there until they complete the secondary automation and the tag is removed. At that point it should continue as planned and I’ve just dramatically simplified my automation (compared to what I currently have inteh screenshot above). This would be a really helpful feature. I like the idea below of waiting until the secondary tag is removed, but having a cleaner solution to running tangent automations would be really helpful. Especially if there are potentially more than just one secondary sequence running in the background. It would be nice to have a clean way of describing a suppression list but allowing them to pick back up where they left off when no longer on that suppression list. Did this end up working for you? Seems like it would, but imagine you would need to add a short wait (5 min?) ahead of the “wait until” condition to make sure the AUTOMATION-ACTIVE tag is added by the secondary automation first and the contact doesn’t accidentally jump ahead in the main automation. This is my first post. But I wanted to thank you for guiding my thinking on this. While the reader is in a SUB automation (between 3 and 7 emails) pause the MAIN email flow. When the SUB automation ends, continue the MAIN automation where it paused. The Initiating Action (usually a click) runs a MAIN-CALLS-SUB automation. MAIN-CALLS-SUB sets a HOLD-MAIN tag to pause MAIN. More automations but less branching. After Infusionsoft this is a whole barrel more fun. I really like that solution. I have the same “pause automation” problem. But I have a question. Do you add this tag control before each mail in the Main Automation? That’s the only point that is not clear to me. My Main automation has around 20 mails. So there are a lot of places to add a previous control. Doesn’t it cause maintenance issues? Yes, that’s correct. You would need to place that “wait until” before every email. If you are picky about exactly when your emails go out, you would want to do the “wait until AUTOMATION-ACTIVE tag does not exist” and as part of that W"wait until" action you could also add a condition that looks like “wait until X day of the week at X time”. Then you’d place the send email action after that. Yes, if you have a lot of emails that takes a little work, but with automations, they will continue working for you for years, so it’s worth it.